Join us on July 23, as we celebrate “Old Ironsides’” much-anticipated return to the water! On that night, Dry Dock 1 will be filled and USS Constitution will float into Boston Harbor after a two year restoration. The USS Constitution Museum will be open to visitors and we welcome you to witness this historic event with us! It’s difficult to believe that 26 months have gone by and USS Constitution‘s first dry docking of the 21st century is coming to a close! Over the past two winters and two summers, Naval History & Heritage Command Detachment Boston ship restorers and riggers have worked hard to complete the necessary work on “Old Ironsides” while in dry dock. These final days and weeks in dock focus on “finishing touches” to get the ship ready for undocking on the night of July 23, 2017. USS Constitution is a large sailing wooden warship. When carrying the 450 men, food and water, guns and military equipment, and rig and sailing equipment to complete her tasks, she sat deep in the water, drawing about 22 feet of water on average. It is likely she had draft (“draught”) marks on her bow and stern when she sailed during the late 18th century and throughout most of the 19th century, but we have no images to show what form those draft marks took. Were they Roman or Arabic numerals? Did they originally begin at the keel, as described by Falconer in his dictionary, or did they begin several feet above the keel line? There must have been some type of markings, but the first image we have of her draft numbers comes to us as recently as 1910, just a few years after her first true restoration. Similar sets of draft marks were reinstalled on “Old Ironsides'” hull at the completion of her 1927-1931 restoration. Some of the numerals may be have re-used from the earlier 1906 restoration, or they may have been newly made in 1930 for the completion of the nearly $1 million, four-year restoration. This style of Arabic numerals was used throughout the rest of the 20th century and were either recycled or replaced in kind when Constitution was re-coppered in the 1973-1974 dry docking and again in the 1992-1996 restoration. 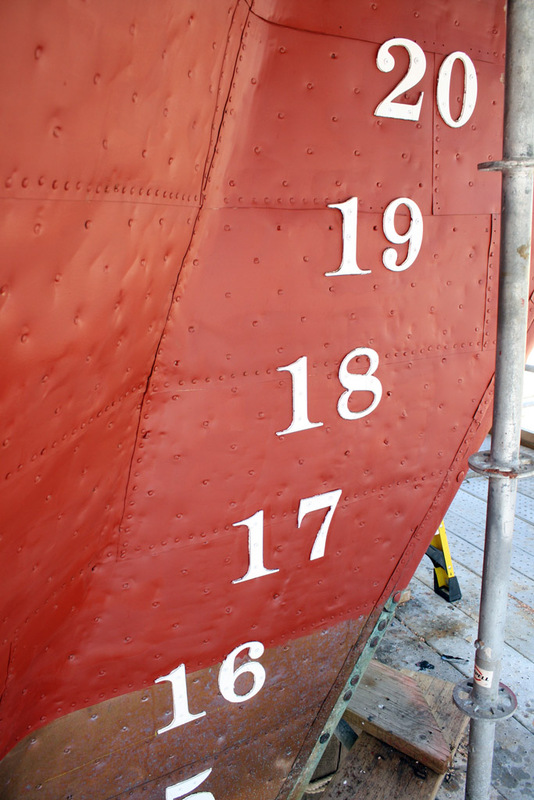 The old numerals were removed for the re-coppering of Constitution‘s hull during the 2015-2017 restoration. Because so many of the numbers had fallen off the hull, new numbers had to be manufactured. The 20th century draft numbers were made of bronze, which is a substantial material to use around salt water, but the bronze reacted to the copper sheathing, thereby corroding of the fasteners holding the numbers to the hull. The new numbers are the same dimension as the old – six inches high, spaced six inches apart to equal one foot in measurement on the hull. The font is Engravers MT and each number was water-cut from stainless steel plates. To prevent the metal-to-metal corrosion experienced with the bronze numbers, the new numbers are backed with a thin rubber membrane and each number is fastened with a stainless steel screw. 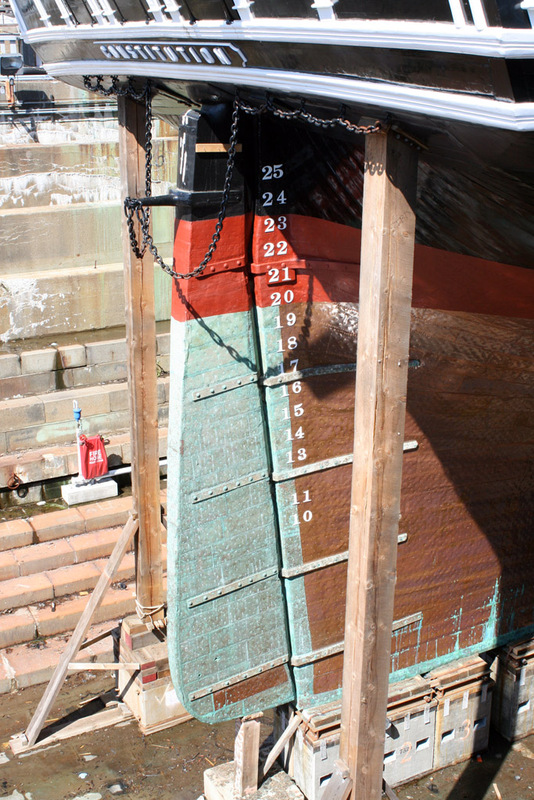 Since at least the 1973-1974 dry docking, when USS Constitution‘s copper sheathing was replaced, fixed fenders have been attached to the hull to protect the waterline area of the ship. For the 2015-2017 restoration, new fenders were once again made, but this time each fender was cut and fashioned to individually fit the contour of the hull. For Bruce Comeau, the Naval History & Heritage Command Detachment Boston ship restorer assigned to make Constitution‘s fenders, this is his second “Old Ironsides” restoration. Bruce, a residential finish carpenter, was hired as a term employee for the 2007-2010 floating restoration where he worked on hull planks, gun port sills, and other projects. He was hired back for the 2015-2017 dry docking restoration and, while he enjoys many aspects of working on Constitution, Bruce says that some of his favorite moments have been “watching a winter sunrise over the dry dock and the ship” when it’s so quiet and peaceful in the Navy Yard. One of Bruce’s large tasks for the 2015-2017 restoration was the re-building of Constitution‘s stern. USS Constitution entered Dry Dock 1 the night of May 18-19, 2015 with just her three lower masts in place. 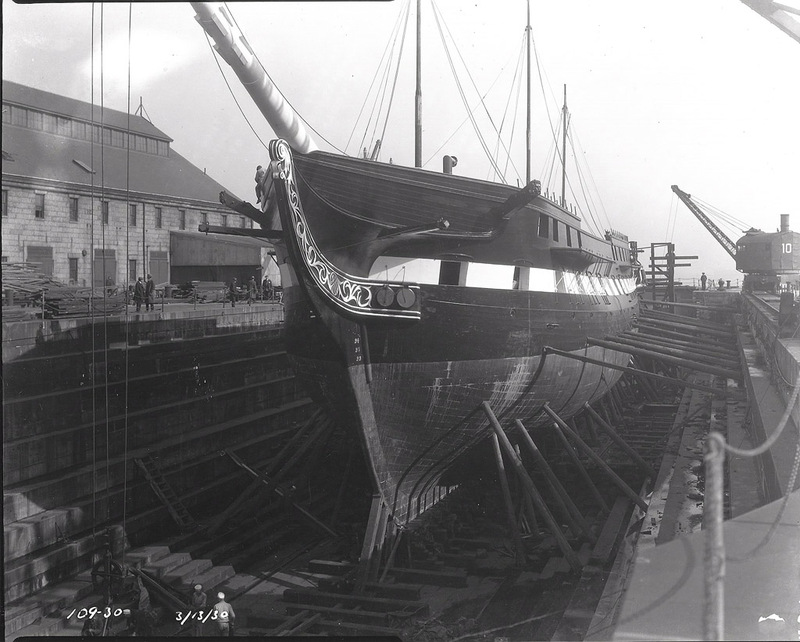 The top masts and the topgallant/royal masts, along with their horizontal yards, had been removed to lessen the ship’s weight and thereby cause her to sit higher in the water when she entered the dry dock. For her undocking, however, it has been determined that she can carry the weight of her three top masts and still have enough water under her keel for her to exit the dock safely. The fore top mast is the last of the three top masts to be installed while the ship is in dock. The NHHC Detachment Boston riggers and crane operators have been busy setting up the standing rigging to support this mast. The guns and carriages that are usually found on USS Constitution‘s spar and gun decks are replicas that were researched and manufactured for the 1927-1931 restoration. Over the intervening decades, the wooden carriages have been re-made and re-built many, many times. The 2015-2017 restoration was no exception and all of the gun carriages have had some re-building and refurbishment done to them. 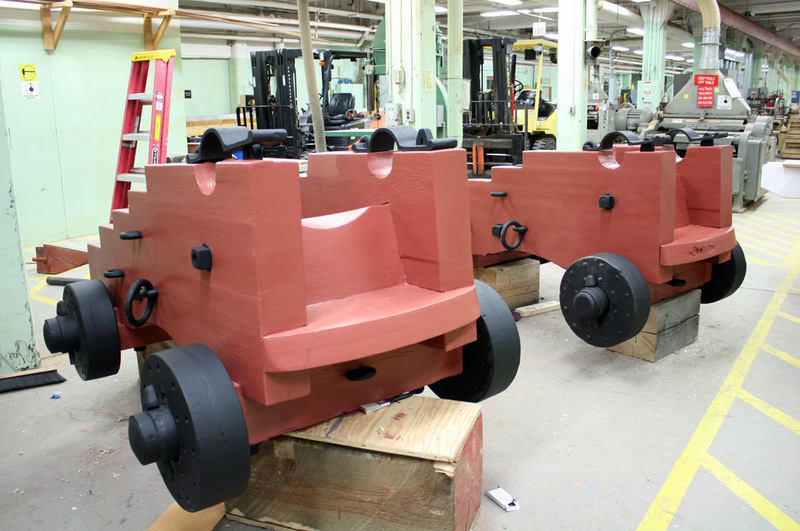 The replica 24-pound long guns are today mounted on laminated white oak carriages and wheels (known as “trucks”) that were last fully replaced in the 1992-1996 restoration. The iron carriage hardware is likely from the 1927 restoration, with some replacement pieces being substituted during the last 90 years. With nearly 100 new planks mostly above the waterline and a few below the waterline and thousands of feet of new hull caulking, the end of the dry docking is marked by painting USS Constitution in her easily recognizable black and white color scheme. In her early years, the ship’s hull sported a yellow ochre-colored gun streak/stripe. Her familiar black and white hull color was established by at least 1811. Interestingly, Captain Charles Stewart had the gun stripe re-painted yellow in 1814, likely in an attempt to disguise Constitution and trick the Royal Navy into thinking she was another British warship in the War of 1812. Each quarter gallery, on the port and starboard sides of Constitution‘s stern after corners, has three, six-paned windows. The quarter galleries and their windows, as currently designed, are early 20th century constructions. 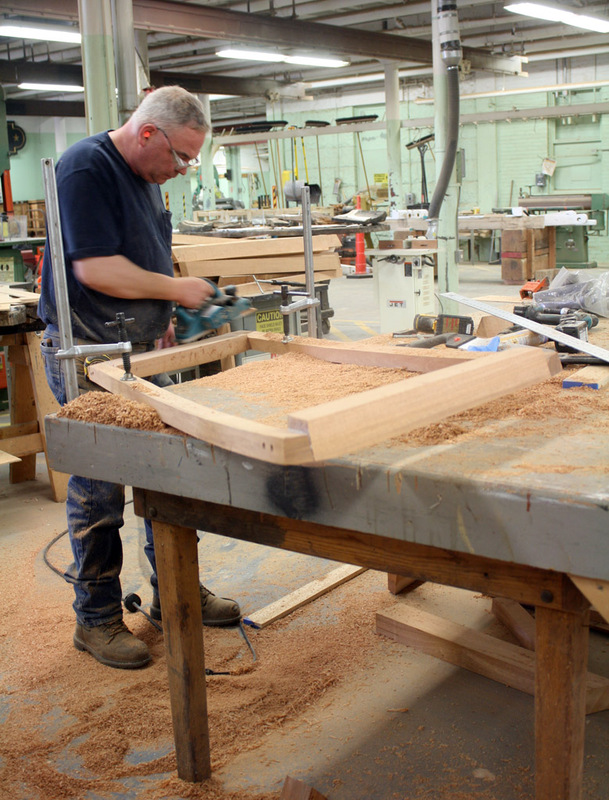 Each window section needed refurbishment and, in a couple of instances, complete re-building. Up to the early 20th century, a few of the window panes opened, allowing for some air circulation. Today, each of the six panes is fixed in the mullions. With just two weeks to go before USS Constitution undocks on July 23, 2017, the “finishing touches” will continue, bringing a gloss and a shine to America’s Ship of State for her refloat into Boston Harbor.